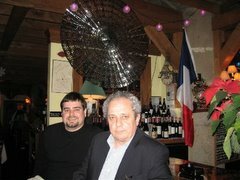 A PERMANENT DIALOGUE BETWEEN A FRENCH FATHER, ALAIN, LIVING IN CHICAGO AND HIS SON, STEPHANE, LIVING IN SILICON VALLEY. BOTH HAVE A SERIOUS FIXATION ON ANYTHING AND EVERYTHING INVOLVING FOOD, WINES, SEARCH FOR NEW EXCITING RESTAURANTS AND RECIPES BOTH IN FRANCE AND IN THE U.S. THE FATHER HAS ALSO AN EXTENSIVE KNOWLEDGE OF FILMS AND IS AN AVID MOVIEGOER AND VIDEO WATCHER. THEY WELCOME ANYBODY WHO SHARES THEIR PASSION TO ASK THEM QUESTIONS ABOUT RELATED TOPICS. Provencal Lamb Stew, a new French Camembert, and a flavorful Vin de Pays de la Principauté d’Orange. Hey Stéphane, hope everything is going well as far as barbecuing in your backyard in MountainView is concerned, and that you can still find that delicious locally fished fresh salmon steaks at your beautiful farmer’s market before once again a temporary ban may be imposed on that kind of catch off the coast of Northern California . Here in Chicago it is still rather grey and cold for the season with lots of powerful showers. I wonder what we will be able to find at the first farmer’s market in Evanston next week-end because I suspect that these deluges of rains that we have been exposed to since early April did not allow a normal spring planting process. Anyway I’m dreaming of sunny days in Southern France, and as it is the case every year, in early May, when the first leaves start to grow in a more assertive way on the sycamores facing our dining-room windows which look a bit like the platanes (plane trees) of my youth, I get a serious case of nostalgia. There is no “muguet” (lilly of the valley, the flower traditionally sold in the streets of Paris on May 1) growing in the park in front of our building, but my nostalgia nevertheless often focuses on our May Day (Labor Day in France) rustic and very proletarian picnics or lunches in Reims and Paris in the fifties and sixties where saucisson, pâté, camembert, œufs durs mayonnaise (hard-boiled eggs with mayonnaise), baguette, and Beaujolais or Côtes du Rhône red wine were generating many moment of pure and simple pleasure. You could read my piece on the Chicago origins of May Day celebration published last year on this blog to get a refresher course on what these Premier Mai celebrations in France were all about, especially regarding the food aspect of them. The other dining nostalgia I develop in early May deals with more elaborate lunches around Easter that always included some delicious spring lamb based dishes that we enjoyed in small restaurants in Aix-en-Provence or Avignon when I lived there. That is why at this time of the year I always love to prepare a simple Sunday lunch or dinner that reminds me of these happy days in Provence or in Paris and includes at least 5 major components that bring some sun to my heart: Some charcuterie as an appetizer, a good salad made of Boston lettuce, Dijon mustard vinaigrette, with chives (or crushed fresh garlic), a small leg of lamb (the shank part), or small loin lamb chops grilled with herbes de Provence. It could also be a more rustic lamb stew with tomatoes and olives. To finish the meal I need a good Camembert and a piece of good quality Roquefort, and for dessert a Tarte à la Frangipane (almond tart). As you know I am not a pastry specialist. So I let your mother be in charge of that marvelous provençal dessert which is one of her many specialties. So this year we started our May 3 Sunday dinner with some “Pâté de campagne au Champagne” from Marcel & Henry , the French charcutiers from South San Francisco, a very peppery, strongly seasoned, very flavorful and very authentic-tasting pork pâté that they sell in individually wrapped thick slices at Fox and Obel for around $ 6.25. And some saucisson sec (dry pork sausage) from independent producer John Volpi in St, Louis (no connection with the better known and more commercial other Volpi). Since I cannot find in Chicago the delicious French Saucisson Sec from Fabrique Délices in Hayward, CA that we buy at your farmer’s market, I found that cheap but very tasty Italian-style and additives-free hard salami made with Chianti to be a perfectly edible alternative treat to French saucisson. It is sold at Trader Joe’s for $ 3.99 for the whole sausage. Of course this first course was accompanied by the traditional garnish of French ‘’cornichons’’ and pickled tiny onions, as well as authentic Dijon mustard, once again all from Trader Joe’s. The baguette is a crusty and well made affair from the very expert baker of Fox& Obel at a relatively acceptable price of $ 2.75. Plat principal (Main entrée): Lamb. But, why is American spring lamb so different from its French cousin? The problem that I find every year is with the quality of the so called ‘’spring lamb`’ that I can purchase in Chicago. In France ‘’Easter lamb’’, as it is sometimes called, either in the form of chops or leg, is very small, with a very delicate flavor, and the color of the meat is a light pink. It is practically impossible nowadays, or if you place a special order for it at your butcher it will cost you a fortune, to find authentic baby milk-fed lamb. That is a real delicacy. The baby lamb in this case is usually 4 to 6 weeks old when it is slaughtered and has not been weaned from his mother’s milk. Its meat’s color is almost white. Over here some very good Greek restaurants might offer it occasionally round Easter and it is spit-roasted. Baby lamb’s weight is around 20 pounds. In France a real spring lamb has usually been slaughtered between 70 days and 5 months after his birth. The meat’s color is a light pink and its taste is quite delicate. Not at all muttony as it is the case sometimes with so called “spring lamb” sold in some American supermarkets. A French spring lamb grew on grass exclusively. It never weighs more than 50 or 55 pounds. You usually find it in good butcher shops between February and June. French ‘’regular’’ lamb is most often 6 to 9 month old. You find it in retail points of sale between September and January. A whole animal is normally not heavier than 70 pounds and the color of its meat is a light red. Its taste is a bit more assertive that spring lamb, but normally still very tender But in Chicago when I buy a small leg of lamb in April or May, it is quite large compared to its French counterpart, its meat has already a relatively dark red hue and is not as tender as it should be. Besides the texture, the taste of the meat, as well as the weight of the piece, lead me to think that this lamb might have been put in a feed-lot for several weeks after it left the pasture and fed some cereal-based industrial feed in order to boost its maturity and weight more rapidly, and of course increase its meat yield. the ‘’Agneau de Sisteron’’ from the area of Haute Provence near the Durance River, or Agneau des Pyrénées (from the mountains separating France and Spain). I usually insert a 3 or 4 slivers of fresh garlic in the meatiest parts of the leg and coat it completely with a creamy ‘’pomade’’ (paste) of Dijon mustard, Olive oil, and Thyme that I have slowly whisked to the point where it is heavily emulsified and transformed into a paste. The meat should be at room temperature. I cook the leg (shank part) on a steel rack in a Pyrex dish with a mix of water and white wine at the bottom in a pre-heated oven at 400 degrees for 20 minutes and then at 350 degrees for 80 more minutes in the case of a leg weighing between 3 and a half to 4 pounds. The meat internal temperature should be 135 degrees for medium-rare when you remove the leg from the oven. You should cover it with aluminum foil and let it rest for 15 to 20 minutes before carving. I usually do carve the leg in round slices around the bone. I serve it with a home-made ‘’ratatouille’’ made of 1 large eggplant that has been cut in 1 inch cubes that you let drain its acrid liquid and some seeds with coarse sea salt in a colander for 20 minutes, 4 sliced unpeeled zucchinis, 4 chopped seeded and peeled fresh tomatoes, slices of 3 yellow medium onions, 4 sprigs of dried thyme, 2 bay leaves, 4 chopped cloves of fresh garlic, and about 6 Tablespoons of extra-virgin olive oil. I sauté all ingredients separately in olive oil, before mixing them in a Le Creuset ‘’cocotte’’. Then I season with salt and pepper from the mill, and simmer the whole thing covered slowly at low heat for 35 to 40 minutes and then reduce the juice for 15 minutes with the lid off. I buy already packaged cubed pieces of lamb stew from Chappetti’s (8 dollars for 1 pound) at Treasure Islands supermarket, trim all the apparent fat, dry the pieces with a paper towel and let it stand for 15 minutes at room temperature. I use either a Le Creuset cocotte (a French enameled cast iron Dutch oven with a lid) or a Fagor heavy steel gage pressure cooker from Spain. Meanwhile I slice 2 medium-size yellow onions and 3 large cloves of fresh garlic (chopped), and I sauté them at low heat in extra-virgin olive oil until soft but not browned with some herbes de Provence. Then I add the meat and brown all pieces (about 5 minutes). I deglaze the bottom of the cocotte by stirring in 2 Tablespoons of a good quality red wine vinegar. Then I add the content of one large can of San Marzano Italian peeled plum tomatoes, juice drained, that I have seeded and coarsely chopped. I add one tablespoon of olive oil. Then I put in about 20 to 25 small pitted Greek black Kalamata olives that I have gently simmered for 5 minutes in boiling water to remove part of the oily brine and soften the taste. Then I pour a cup of low-sodium low-fat chicken broth (usually I use Swanson’s because I find the organic broth from Whole Foods overpriced and bland) and 1 cup of dry white wine (I use the Sauvignon blanc from Shaws at Trader Joe’s. I would never drink it but it is perfect for cooking), or even better of a dry rosé ‘’vin de pays’’ wine from Languedoc, like the Domaine de Gournier. I season the whole thing with salt and freshly ground pepper and add a few more sprinkles of dried Herbes de Provence. Then I add 2 tablespoons of tomato paste blended in some hot water. I stir well and bring the content of the pot to a gentle boil, then cover and let it simmer for 90 minutes. Check for tenderness after one hour, adjust the seasoning, and add wine if necessary. I usually serve this dish with ‘’farfalle’’ pasta (usually the good Italian one sold under the Trader Joe's brand) sprinkled with chopped parsley at the last minute. If you do this dish in a pressure cooker set up at high pressure, do everything in the same way as described above, then close the lid and bring the pressure up on high heat. Once you hear the hiss from the valve and see a continuous wet steam coming out of the valve reduce to medium heat and cook for 15 minutes. Then remove the cooker from the burner, release the steam according to the instruction manual, wait until the pressure is completely out of the system and open the lid carefully. Then pour the content in a rustic looking earthenware dish. The French love to have a green salad course after the main dish. I keep with that tradition that I find not only refreshing but also it helps your digestive track to adjust as a transition between a meat-based dish in a sauce and the next course of cheese. I would love to have a ‘’mesclun’’ (mix) of various fresh greens including ‘’frisée’’, ‘’roquette’’ (arugula), feuille de chêne (oak-leaf lettuce), Bibb, and radicchio. But in early May in Chicago it is difficult to find good quality fresh greens of this sort. So I limit myself to a single Boston. I wash it well and dry it in my OXO salad spinner that works pretty well without breaking the leaves. In the mean time I prepare my dressing, a simple vinaigrette, the following way: In a large ceramic bow I put 1 teaspoon of salt, some freshly ground black pepper, and 2 tablespoons of Dijon mustard at room temperature. Then I add 2 Tablespoons of a good quality red wine vinegar (I usually use the Pompeian brand) and whisk that mix well to make sure there are no more lumps of mustard left. Then I progressively add the extra-virgin olive oil (I use the 100% Kalamata Greek extra-virgin olive oil from Martini’s from Trader Joe’s) . That oil is the best I could find so far for a full liter at $8.99 a bottle. The date of expiration, usually 2 years after bottling, which in my opinion is way too long, is engraved on the bottle and that allows me to make sure the oil is still fresh. I whisk the oil continuously while holding the bowl at an angle so that the oil easily gets emulsified in the mustard and vinegar mix without separating. It creates a very nicely smooth vinaigrette dressing. You should stop when you get about 1/3 of a cup which should be enough for a large Boston. Add the leaves of lettuce to the bowl and some freshly cut chives and mix them well with the dressing with a large fork and spoon made of wood. I personally use French ustensils made from the wood of olive trees. You can find practically all kinds of good quality French cheeses nowadays in Chicago. But most of them have become too expensive for my limited budget. So I can no longer afford the kind of cheese plate that I used to prefer. It included Camembert, Reblochon, Cantal, Tomme de Savoie, and Roquefort or Bleu d’Auvergne, and a Pyramide of goat cheese. At least I’m relieved to know that the U.S. government has reached an agreement of principles with the E.U and will no longer apply a 300% tax on Roquefort cheese. So these days I am content to find a good French Camembert from Normandy, if possible only ‘’thermisé’’ and not fully pasteurized in order to keep some of the original aromas of the real thing made with ‘’lait crû’’ (raw milk) that you no longer find legally in the US.. "Thermisé" means that the milk has been heated enough to kill bacteria but not at a temperature as high as in the pasteurization process that really diminish the real flavors and taste that a camembert au lait cru would offer. If you remember my piece on camembert published in this blog 2 years ago, the only two brands I had found that were satisfactory were Le Châtelain, and Isigny. But recently I found one that is even closer in taste and texture to the kind of Camembert I buy in France. It is sold exclusively by Whole Foods with a label saying: Selected by Hervé Mons. Now, I have done some research and found out that Hervé Mons is a very reputable négociant-‘’affineur’’ (cheese ager) of cheese who sells from his specially designed ‘’caves et ateliers d’affinage’’ (specially designed cheese aging warehouses) in Roanne all kinds of ‘’artisan’’ cheeses to good restaurants, specialty shops and outdoor food markets.The company was started in 1965. They do a very good business with export. His importer in Washington state had asked him to produce a real camembert from Normandy that would be able to travel well to various points of the U.S market and keeps its intrinsic qualities of aroma, texture, taste, and appearance, while remaining fresh enough to avoid getting this unpleasant ammonia taste of many French camemberts that have been improperly aged or stored in U.S. warehouses, or in over-refrigerated conditions for too long. Hervé Mons worked for a whole year with local cheese makers in Normandy to reach this goal. The result was so impressive that Whole Foods Fromagerie asked him to be his exclusive point of sale to the public in the U.S. The Hervé Mons camembert I bought was perfectly aged, ’’à coeur’’ (ripe in the middle but not over ripe) and its rind was perfect in color (still bloomy with light golden colored strips) and texture. What a moment of pure pleasure we had. I paid $ 6.99 for it but its normal price is 8.99 dollars I also had a very small piece of a very good raw milk Roquefort from Binny’s cheese shop but I do not remember what brand it was. It was fine, freshly cut, but not spectacular for the price: $ 25 a pound. Since I did not bake it I will only mention the basic ingredients and instructions: Pie pastry dough in a buttered mold after being rolled. In a small sauce pan mix by stirring well over low heat 3 whole eggs, half cup of sugar, 1 stick of unsalted butter, and one small can of almond paste cut in small pieces (Solo brand I believe). Pour the whole thing into the dough-covered mold. Bake at 400 degrees. When frangipane filling is firm (about 30 minutes) brush top with egg yolk. Stéphane: Ask your mother if you need more specific instructions.
. A selection of Ravoire & Fils in Lauris, Vaucluse The country wines from that district usually come from grapes harvested in several townships in Vaucluse such as Orange, Valreas, Vaison-la-Romaine and Bedarrides, to mention the most well-known of them. I do not think that this blend of 80% Grenache and 20% Syrah is a ‘’vin de propriétaire’’ (from a specific vineyard owner) but, I know that it is bottled by the family-owned Ravoire Company, a good wholesaling company also from Vaucluse whose president has a long tradition of winemaking in his family. Stephen Gaucher, the very competent president of the importing company, Wine Adventures in Iowa, that imports good and exciting French wines since 1999, told me that the grapes are harvested in the Sainte Cécile aux Vignes area, a few miles Northeast of Orange, in the beautiful Département du Vaucluse. In this medium-body red charmer you can feel the sun-drenched terroir of the Southern Rhône. It offers very pleasant notes of ripe plums and red berries, and develops well in the mouth with secondary touches of leather and licorice. It is indeed a very well made, but not too complex, wine who was awarded a gold medal at the Concours Agricole of Paris in 2008, it has a very good balance of fruit and acidity and would be an ideal companion for any lamb-based dish, grilled eggplants, zucchinis and tomates provençales. Also it can be a perfect wine for summer barbecues. I hope you will enjoy it as much as I did. I bought it at Binny's for a special "end of bin" price for Binny's club members, but the regular price is around 8 or 9 dollars. Bon appétit. Born and educated in France. In Chicago since 1970. American wife, a free-lance writer and journalist. Two sons and a grand-son. Since my childhood during World War II in the Languedoc and Geneva, Switzerland, and especially since the late forties when my parents moved from Southern France to Reims,the capital of the Champagne producing region, where we started to eat a little more normally, I had lots of exposure to the secrets of good food and wines. My Swiss grand mother, aunts, and my mother were great ''cordons bleus''and taught me many of their cooking techniques and secrets. My father initiated me to the art of wine selecting and drinking when I was 17 and explained to me the various regional food specialties of the French provinces. And when I was old enough to accompany them to restaurants, my parents introduced me to the world, rules, and tricks of restaurant going. Since my student years in Aix-En-Provence and Paris, I never stopped trying to improve my culinary skills,to experiment with an ever growing spectrum of new wines and different types of foods from all over the world, and to conduct a non-stop search for new exciting eateries.